Reinhardt Eagles are putting their best foot forward for RecycleMania geared at encouraging more students, staff and faculty to recycle instead of just dumping. 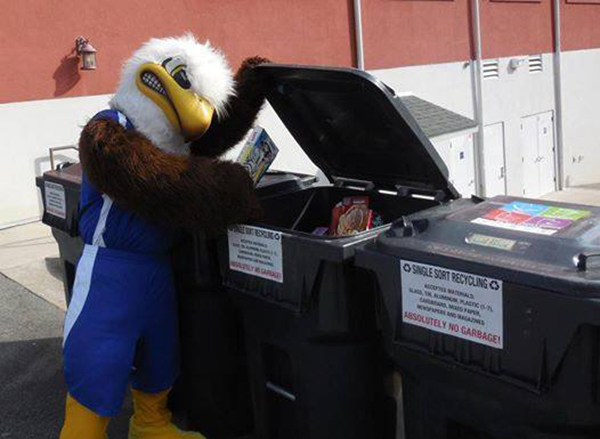 Soar the Eagle gets on board with RecycleMania and encourages everyone to participate. 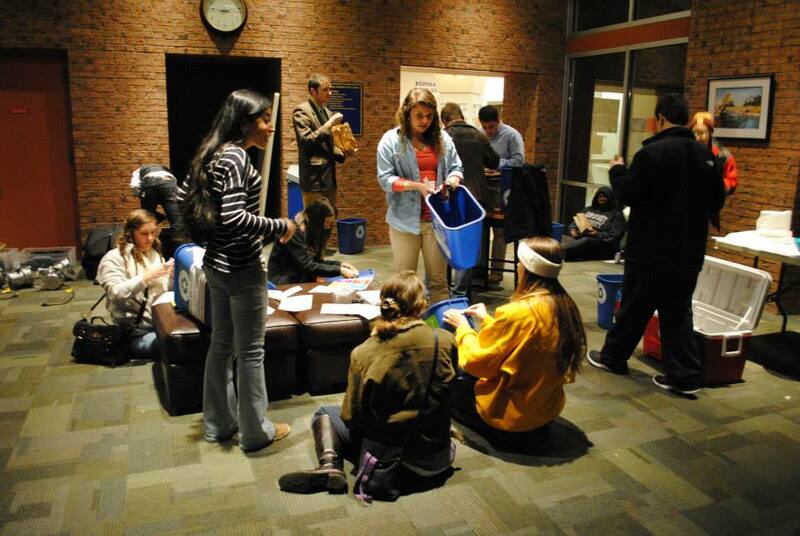 Every year, RU Green holds a-decorate-your-own recycling bin event to kick off RecycleMania. RU Green Program Coordinator Zach White said the event helps get students excited about recycling. Reinhardt began participating in the RecycleMania program three years ago when it started single-stream recycling. RU Green’s goal for the 2016 competition is to recycle 20,000 pounds. At the halfway mark, the university was at 7,240 pounds. The competition ends April 2. White said the university has recycled 28,860 pounds in the single-stream recycling center since the school year began in August. While the university is competing in the benchmark division, which means no actual prizes, White hopes RecycleMania will serve as an internal catalyst to get more students, faculty and staff to recycle. Recyclables accepted include aluminum and steel cans, cardboard, paperboard, glass jars, bottles of all colors, junk mail, magazines, newspaper and plastics Nos. 1 through 7. Every week, RU Green Program assistants and Reinhardt students, Brent Blackwell, Shelby Bennett and Mary Echols empty more than 70 single-stream recycling bins on campus, from the gym to the Falany Performing Arts Center and the recycling center located in the parking lot between Roberts and Gordy Residence Halls. RU Green asks that cardboard be broken down and that bottles and jars be rinsed out before being disposed of in the recycling containers. Any shredded or hole-punched paper should be put in a bag. The recycling center does not accept Styrofoam, plastic garbage, grocery and Ziploc bags, shrink wrap, bubble wrap, dishes, glasses, mirrors, aerosol cans, light bulbs, batteries, paint cans and household or personal garbage. For more information on the RecycleMania program, visit www.recyclemaniacs.org. For more information on RU Green, visit http://www.reinhardt.edu/Current-Students/Student_Activities/Get-Informed/RU-Green.